The HOTEL proposal focuses on the design, testing and validation of a new innovation working method for Technology-enhanced Learning (the HOTEL Innovation Cycle) through the setup of Learning Exploratorium Labs in three innovation-friendly learning environments: one in higher education, one in a corporate setting and one within an international professional network focused on eLearning quality. The HOTEL project is conceived in the Seventh Framework Programme , funded by the European Commission, and it will be executed as part of the Specific Programme on ‘Cooperation‘ , precisely, within ‘The ICT Work Programme’ . The HOTEL Consortium integrates six partners as follows: UNIR , Menon Network (Project coordinator), Brunel University, EFQUEL, AtoS y ELIG. 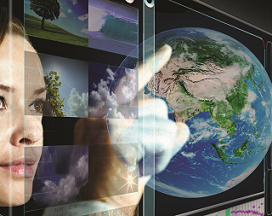 This proposal originates from the observation that most of the TEL research so far has concentrated mainly on the development of ad hoc technologies for learning, failing to capture both the potential adoption of emerging technologies not originally designed for learning in education or training environments, and the innovative use that is made of technologies in non-formal and informal ways of learning and the extent to which this could be transferred/adapted to formal learning environments. Furthermore, too often the timespan between the identification of technologies that have a potential for learning, the theoretical analysis of pedagogical implications, the piloting of such technologies and their adoption is so long that the technology itself becomes out-dated compared to the changing environment and learning needs. Based on the problems identified above, the HOTEL Support Action aims to contribute to more effective, holistic and faster innovation cycles in European TEL, by increasing quality at the level of the cycle itself and of the different phases foreseen, that can be replicated in the future. 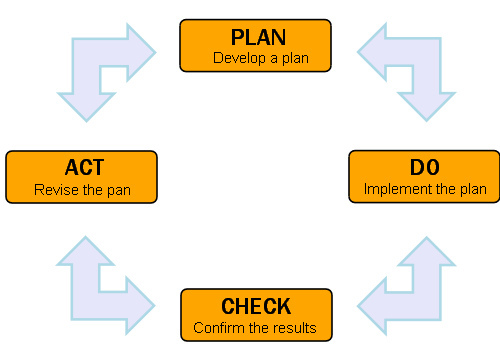 In order to establish a sustainable working paradigm (the HOTEL Innovation Cycle), HOTEL is taking inspiration from the “Deming Cycle” model, a model designed for continuously improved quality of processes and effectiveness. The designed innovation cycle will be piloted in three real life environments through the setup of three Learning Exploratorium Labs on higher education, workplace learning and informal learning in professional networks. This Learning Exploratorium Labs can be considered a sector-oriented variant of the well known concept of Living Labs. During the first phase, the three approaches to identify new ways of using technology to support learning that compose the HOTEL innovation cycle will be explored. On one hand, the WP1 will deal with emerging technology analysis, spotting what technologies are expected to emerge in the next ten years. On the other, WP2 will “filter” learning theories through practices and WP3 will analyze emerging technologies for learning, starting from the grassroots. 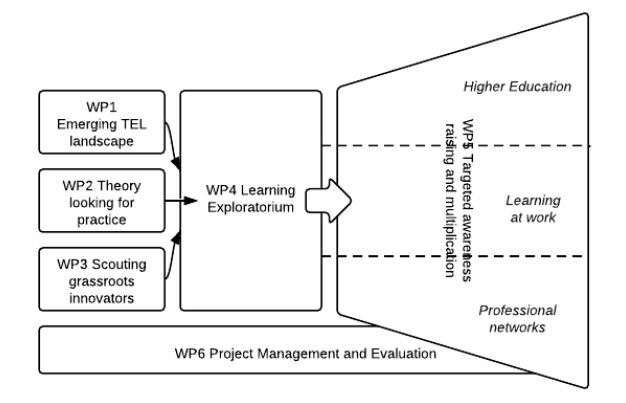 During the second phase, the project will work to explore original ways to use ICT in the field of learning in the three above-mentioned main contexts.WP4 plans to create three Learning Exploratorium Labs in order to validate TEL research and to adopt a fully holistic perspective on the manifold possibilities of ICT to enhance learning, mostly informal and non-formal one. During the whole project duration, two transversal WPs will run: WP5 amis to build and multiplicate targeted awareness, making sure that the results of the project experimentations and the proposed innovation cycle are disseminated to all the relevant stakeholders group. WP6 is dedicated to project management and evaluation, which runs throughout the 24 months of project duration.